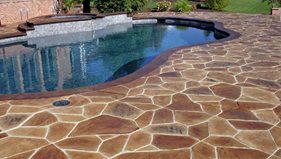 In the residential market, stamped concrete is turning heads and boosting curb appeal as a paving material for driveways, pool decks, walkways, patios and entryways, often as an alternative to brick pavers or natural stone. And it's being installed in all areas of the country, from Southern California to Northern Minnesota. That's because no matter what the climate, properly installed decorative stamped concrete offers the same durability, strength and permanence as conventional concrete. When the right mix design and placement procedures are used, exterior stamped concrete can be installed year-round in most regions of the country (see our seasonal pouring tips). And it doesn’t matter whether your stamped concrete is exposed to freeze-thaw conditions, the harsh desert sun, or salty ocean breezes. 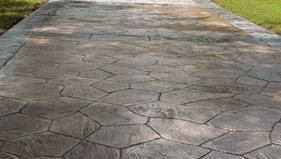 When properly sealed and maintained, stamped concrete will withstand even the harshest weather extremes. Furthermore, with sufficient reinforcement, it also bears up well under vehicle and heavy foot traffic. Because of these qualities, stamped concrete is also a practical choice for enhancing public places, such as theme parks, shopping malls, lobbies, parking lots and zoos. Pool deck in Gig Harbor, Wash. Pool deck in Rialto, Calif.
Front porch in Cokato, Minn. Pool deck in Denmark, Wis.
Entryway in Oklahoma City, Okla. Pool deck in Crescent, Pa.
Walkway in Charles Town, W. Va. Pool deck in Acton, Mass. Walkway in Old Greenwich, Conn. Pool deck in Ottawa, Ont. Installing concrete floors stamped with tile, slate, fieldstone or even wood-plank patterns in entrances, kitchens, family rooms and basements. Enhancing walls or fireplaces with vertical stamped overlays. These lightweight cement-based mixes can be applied thickly to wall surfaces without sagging, making it possible to imprint them with deep cut-stone patterns. Adding decorative interest to concrete countertops, bartops and bathroom vanities. Even small embellishments, such as delicate leaf imprints, can have a dramatic impact because these surfaces are closer to eye level. Rejuvenating existing concrete floors with stampable polymer-modified overlays, which offer the same design options as conventional stamped concrete.